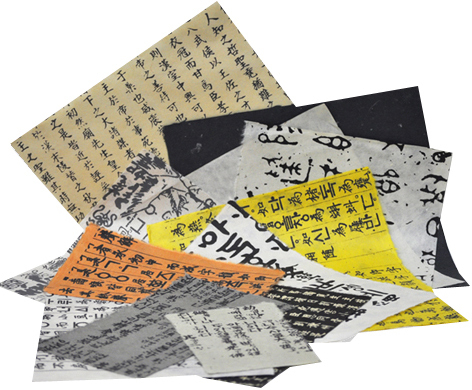 If you are a collage or mixed media artist, (or just a paper freak - “never met a piece of paper I didn’t like”), then you are going to love our Orient Express “Loose Paper Parts”, which contain smaller, random sizes of various styles from our Orient Express Papers Collection. Ideal for collage & mixed media artists when you want a big variety, each 10” x 10” package of Orient Express “Loose Paper Parts” has 10 pieces of random sizes of different Orient Express Papers, plus two additional pieces of Handmade Papers in a charcoal black and a pale cream to contrast and combine with the patterned papers, giving you a total of 12 pieces in each pack. They’re also great for all kinds of craft projects. I used them frequently on HGTV for The Carol Duvall Show to cover all kinds of smaller things – from tea chests (a natural) to river rocks. Want more and bigger??? Our full size Orient Express Papers are an exotic collection of HUGE – 25” X 37” (that’s more than 2 ft. x 3 ft.!) 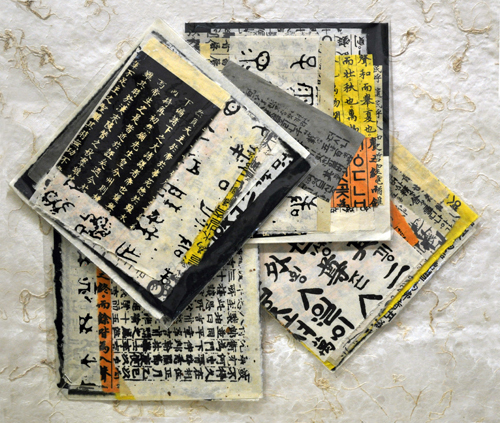 paper sheets with a variety of various styles of kanji on different colored backgrounds. Click the button below to add the Orient Express Loose Paper Parts to your wish list.